Lieutenants Bauscher and Hauplnthal were enjoying a New Year’s Day after a week or so of down time at south base at Muroc Army Air Field. It was a brand new year, 1944, in a world at war and the two young pilots knew that war did not pause for celebrations, as young men in fox holes and sailors on ships around the world never got a break . The young crew were at Muroc to train in B-24s to learn the skills they would need to take the battle to the enemy in far off lands. A B-24 carried a crew of ten men and they trained together to become an efficient working team, so when the day came to wade into battle each would know their job and perform their duty with pure instinct. On the duty board, the crew was notified that on January 2nd they would be back to business with a 10 p.m. takeoff and a cross-country navigation mission, followed by bombing practice on the Muroc bombing range. They knew they were in for a very long night. Arriving at the flight line, B-24 #42-73358 was fueled, loaded and ready to go. The crew watching the sunset before their takeoff briefing never realized they would not see the sun rise on January 3rd of 1944. 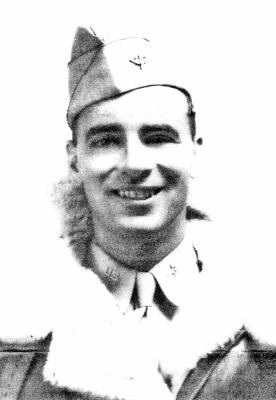 Lt. Daniel S. Logan, navigator of #348. The 10 men were made up of nine young men under 22 and one 26-year-old man who was the radio operator known to the crew as “Gramps”. They were the typical American soldiers of the time and they came from every corner of the country. 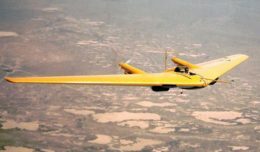 At 10 p.m. the planes left their hardstands and one by one took to the skies for their missions on that clear, cold, moonless night. The mission itself is something I have shared with many groups over the years with my Power Point presentation that dissects the mission step by step and shows what happened to eventually end up with this disaster. But in the interest of space, I will forward to the final seconds of #358. The two young lieutenants at low altitude had Muroc in sight and were waiting final instructions for landing. Standing between them and the safety of home was a rocky butte that on a moonless night waited for them with a cruel fate. The crew nested in the plane, their work done for the night. They looked forward to breakfast and warm bunks – but with a loud bang and a shuddering airplane, within minutes they would only be going home as memories to 10 American families. In the Muroc control tower, it was 4:15 in the morning and off to the east a fire could be seen burning in the distance. Calls to remaining airborne aircraft were sent out and all responded except one, #358. In the early morning light, fire crews and an ambulance reported the sad news that a B-24 was down and burning and that there were no survivors. The most costly aspect of war – death – had struck again, and way too many times it was in training, and not on the battlefield. 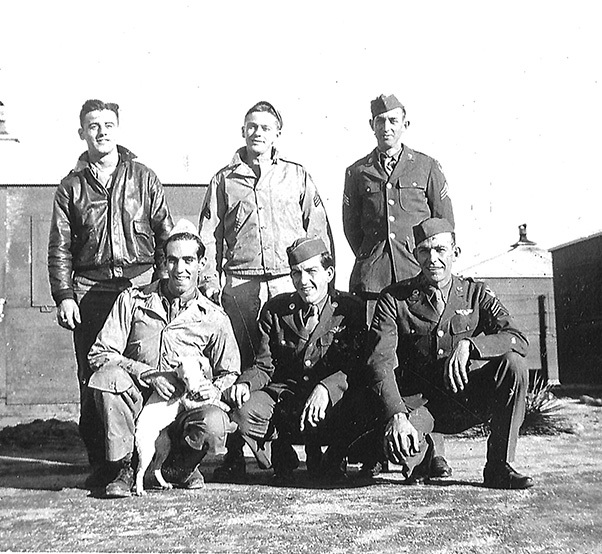 The is the enlisted crew and their mascot at Muroc that were lost in #348. I think back to what the families must have felt when, after celebrating the New Year, the Western Union man showed up with the cruel twist of fate that their sons were casualties not of far-off battlefields, but of the relative safety of training in America. A very young 1944 would hold heartache for 10 more American families. The Los Angeles Times and the names of the crew and their home towns. There is so much more to this story than I can share here, that gets into more details about each crewman and the time up to and the aftermath of their deaths with the surviving family members. I hope that someday I get the chance to share this story in complete detail with all those that find this subject matter interesting and educational. But more important, I just held off on telling this story until it was around New Year’s and using it to share the message that each New Year holds great promise and also much heartache. But the loss of these 10 young men was not in vain, for they were part of the long line of American Patriots that answered the call of their nation and have inspired generations of patriots since that meeting with destiny on a cold dark night, in the deserts of the Antelope Valley. Till next time, Bob out.